Just back from the UK Games Expo – a fun event for all ages at the Birmingham NEC showcasing creative games designers, model makers, authors, artists, cosplayers and Vikings! The authors’ genres spanned fantasy, paranormal, thrillers, history, sci fi and time travel. There was a real buzz about the event, and I enjoyed networking with fellow authors, sold a few books, gained new mailing list subscribers, and met and chatted with some lovely people. I enjoyed the great atmosphere and admired the imagination of the games creators and the talents behind some stunning graphics. A love of story drew people in – for that is the one element shared by us all. It was also a joy to see the fantasy characters and strange creatures passing by in their magnificent cosplay outfits. Why not put the UK Games Expert in your diaries – it’s a wonderful event which takes place over a weekend in early June each year at the Birmingham NEC. Thanks to Richard Denning, author, games creator and UK Games Expo organiser, for the opportunity to exhibit there on the Author Stand. Thank you to all of you who read and enjoy my blog posts. I greatly appreciate those who support me by following, reading, liking and commenting. I hope to continue providing you with short inspirational blog posts about any subject that catches my eye! It’s been a busy few days as I have been listening to successful woman writers speaking at two exciting events – a visit to Ingram Spark (book printers and distributors) and a tour round their digital printing facility in Milton Keynes; and the following day I was in London at the George IV pub in Chiswick, on the day of Harry and Meghan’s wedding, to attend a fabulous networking event “The Bloggers Bash”; and finally I attended a fair in Nuneaton to sell signed copies of my books. Here below I give my statement about this blog, as required by the GDPR which comes into effect on 25th May 2018. This is a short post re: GDPR which comes into effect on May 25, 2018. When you leave a comment on this blog WordPress will automatically store your gravatar name, IP Address, comment, and email address. Therefore, leaving a comment is considered a definite intention, as defined by the GDPR giving me consent to store this information, and permission to contact you in the future. But please rest assured that your personal information will not be sold or shared with any third parties under any circumstances. If you wish me to remove your data for any reason please get in touch. Genre: What is it Exactly? Posted on October 3, 2017 October 2, 2017 CategoriesAbout Books I love, Authors I love, Books, British, British psychological suspense writer, creative writing, inspiration, life, literature, modern Gothic fiction, Mystical Circles, New psychological thriller fiction, paranormal thriller fiction, people of inspiration, psychological suspense fiction, SC Skillman, SC Skillman Author, UK, WritingTagsauthors, blog tour, blogger, books, fiction, gaming, genre, paranormal, psychological suspense, reading, SC Skillman6 Comments on Genre: What is it Exactly? On 2nd September on the second day of my Mystical Circles blog tour, blogger Jenny in Neverland hosted a guest post from me on her blog. As a writer, I believe we should be willing to explore new areas, and to step outside our comfort zone. And that applies very closely to us as readers too. I read a wide variety of books, both non-fiction, and fiction of all genres. I admit I do like psychological insight but I believe all good writers in every genre should incorporate that in their novels anyway. I find that the way I think about genre is influenced by my own eclectic reading habits. I did have quite a bit of trouble trying to work out what genre I was writing in myself. Writers are given an enormous amount of advice these days, mostly from online sources, and amongst them is this adage: Write the kind of book you most love reading. But if you read a wide variety of books, how does this help? Another piece of advice we find floating around the internet (perhaps propagated by the commercial publishing fraternity) is that an author should, when writing a pitch to a literary agent, be clear what genre he or she is working in, so the agent reading the letter can immediately think, “Whereabouts in the bookshop will this book will go?” Another piece of advice suggests you should name a few established authors to whom your novel could be compared. All this is anathema to me – and to many other writers, I suggest. Yet we are forced into this kind of mindset. 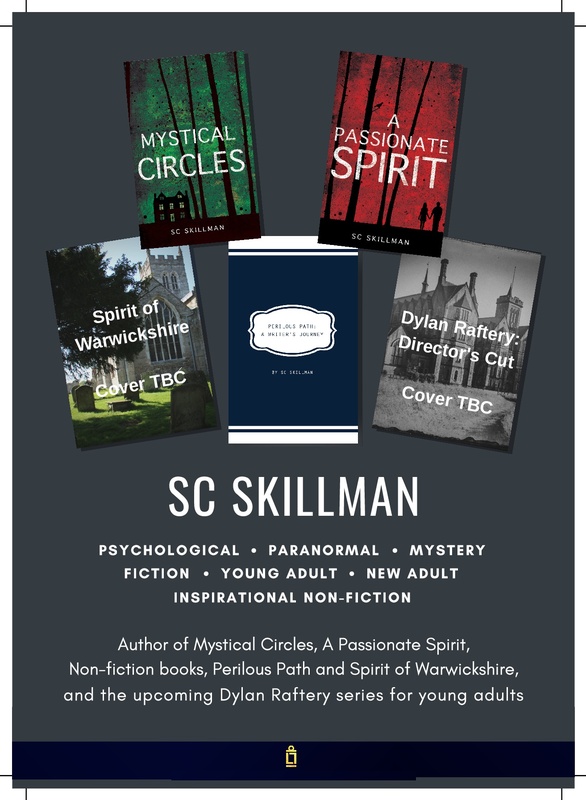 So now, for the benefit of the readers of this article, I shall say that Mystical Circles is psychological suspense with a flavour of paranormal. An example of my willingness to go into new areas is my recent attendance of the UK Games Expo, as one of five writers on the Authors Stand; and for a while, we were alongside a bestselling author and his legion of fans queuing up for signed copies: Ian Livingstone, the successful creator of the fighting Fantasy gamebooks series. So what do fighting fantasy and roleplay games have to do with books such as the ones I write? I admit I knew nothing of the UK Games Expo until I was invited by the organiser, author Richard Denning, through his father John (a friend of mine) to come and exhibit/sell my books on the Authors Stall all weekend last June at the Birmingham NEC. It was a fabulous opportunity. The gaming world is one that I haven’t paid too much attention to, but the whole weekend was a revelation. I gained some new insights into how my own work is indeed using some of those tropes, for instance, the predicament of the main protagonist as she finds herself in a deadly situation from which she must escape. Hidden chambers and secret passageways and dark rooms all find their place in the gaming world. There was an unexpected connection for me. Mystical Circles is set in the real world but the world Craig inhabits moves further and further into a world of impossible ideals – and the paranormal, an area in which he has special gifts. Hidden chambers and secret passageways and dark rooms all act as symbols for states of mind – and thus their connection to the world of psychological suspense fiction. And finally, family relationships, which play a strong role in my novel. Problematic relationships between father and son, between two sisters, between twin brothers, between mother and son… I find these provide a fertile ground upon which the action of my novels can be played. Which leaves me still with a fluid situation as regards genre; though now I write psychological suspense, the paranormal element is getting stronger, and maybe in the future I could move into areas of fantasy and magical realism. All is possible.